A self-published author based in the South Pacific has released a book which includes educational tools for children with fun animations to boot. 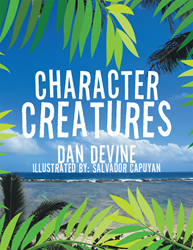 The book, “Character Creatures,” by author Dan Devine, is a collection of short stories which educate children on various topics, including science, geography and moral education. ‘Creatures’ features 18 short stories, as well as an illustration to accompany each. The stories include one creature with a child’s name Devine chose, as well as a certain character trait. What’s more, Devine incorporates topics such as science, with information about each creature, and geography, with information on where the creature can be found on Earth. With each story, Devine hopes, with the help of parents, spiritual values will be instilled into children. Colorful illustrations combined with elements of science and geography, “Character Creatures” will educate children and keep them entertained at the same time. Born in New Mexico in 1949, Dan has enjoyed wonderful opportunities living in America, Italy, Turkey, Tonga, and Fiji. During his twenty years as a USAF pilot, he flew many air refueling missions around the world, including one over the North Pole. Dan served in several environmental engineering firms before he hit the jackpot-he became a science teacher at the age of fifty-two. Now he is pioneering for the Bahá'í Faith in Tonga and teaching classes on engineering, architecture and environmental sciences to Tongan College students and a religion class at Tonga High School.